Valletta 2018, together with Belgian theatre group Laika, presents Cantina, a performance playing on audience’s sense of taste and smell this weekend at Ta’ Qali. Three performances will be taking place, between Friday 11th May and Sunday 13th May. 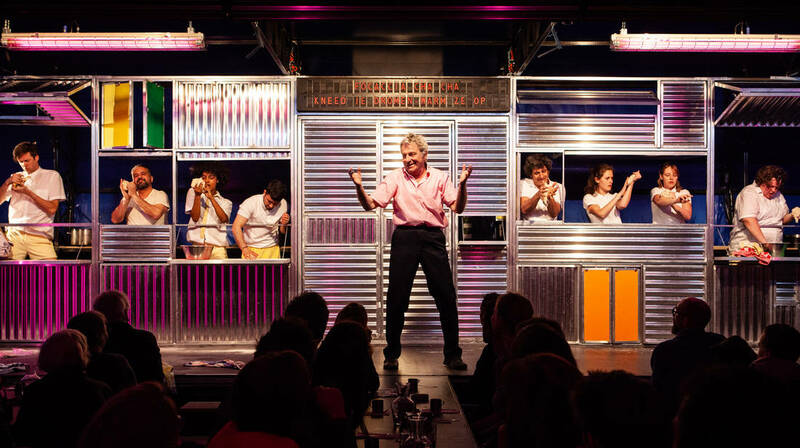 Laika, a theatre company based in Antwerp, Belgium, creates a ‘theatre of the senses’, and imaginative, culinary productions aimed at anyone who has retained their childlike capacity for wonderment. Laika finds that the world is full of surprises and that nothing can be taken for granted; whether it is feelings and ideas, tastes, smells or colours, the world is one big playground ready to be explored. Laika’s performances are all about the senses through sampling epic stories and anecdotes, new recipes and unfamiliar worlds. The performance, Bertolt Brecht’s modern classic, Saint Joan of the Stockyards, directly engages with its audience thanks to Laika’s unique approach of using food during the spectacle to look at the themes of social class, capitalism and the struggles associated with them. Vegetarian food, prepared by Laika’s qualified chefs, will be served by both Maltese and Belgian actors during the performance. Join a rowdy group of performers to feast on exquisite dishes prepared in tandem with the performance. Delight yourself in ninety minutes of laughter, food, and drink as a culinary revolution unfolds in front of you. Rooted in solidarity, this diverse project also included workshops which were held in February, designed to explore the diverse food values and customs that our communities hold to heart. Those who took part in these workshops will be part of the Cantina cast performing this weekend. Cantina will be held on Friday 11th May and Saturday 12th May between 9pm-10.30pm and on Sunday 13th May between noon and 1.30pm in Ta’ Qali (behind the Greek Theatre).